To help kick-off Walker Open Field, five guests from across the spectrum of art and ideas have been invited to share thoughts and pose questions on the cultural commons, framing a conversation that will continue throughout the summer. We’ll be posting our notes on each of these presenters over the next two weeks, and encouraging them to drop by Walker Blogs to recommend readings and other resources. The event kicks-off at 7pm on Thursday, June 3rd. Save the date! – An English protest chant, circa 1600, to object against the British Monarchy’s habit of building fences around and on common land. The idea of the commons has long been tied to ideas of exchange and livelihood. Who has control over resources? How are these resources shared, maintained, and valued? In the 1600’s, talk about the commons generally referenced physical resources: open land for grazing livestock or the forest where firewood could be collected. Today, our definition of the commons has opened up considerably, but the ties to exchange and livelihood are still at the forefront of the discussion. Caroline's Work Dress, an Ourgoods.org pilot project. We asked Caroline Woolard to speak at Opening the Field because her work is a significant part of a movement advancing that discussion for makers, doers, and thinkers who have traditionally found it hard to monetize their skills and resources in our existing economy. Caroline is one of the founders of OurGoods.org, an online community of artists that facilitates barters of skills, space, labor, and art objects. The site matches barter partners, provides accountability tools, and tracks projects. One morning a couple of weeks ago, Shanai and I spent about an hour Skyping with Caroline, who lives and works in Brooklyn, NYC. Before talking specifically about OurGoods, we talked about how she got to where she is today, about the nature of collaborative work, and about the difficulties and rewards of trying to keep an artist-run art space afloat (work we can certainly relate to). Caroline really began thinking about exchange when she wanted to barter a dress she’d made for help designing and coding a website. 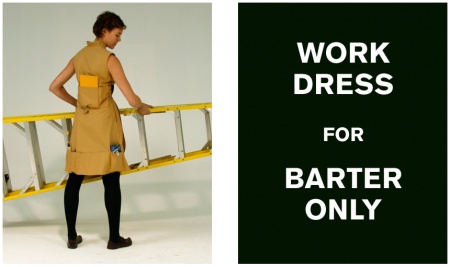 The Work Dress is now an OurGoods pilot project, and a great example of the network in action. The garment is a hybrid tool belt/wrap dress, and is only available by bartering skills or resources with Caroline. To date, she has exchanged one for unlimited access to laundry facilities, a chapbook of poetry, lifestyle consultation, and expert help designing Work Dress 2.0. Ultimately, OurGoods is an open-ended platform for the organization, support, and completion of creative projects. Beyond just facilitating person-to-person exchange, the site “offers a dynamic online environment in which artists can follow each other’s creative development; organize “under the radar” artistic activity of their community; develop mutually supportive relationships offline; and learn new skills to enable their own work and the work of others.” All without the need for cash funding from outside of the community. The website is currently in an invite-only testing phase that is focused on the NYC area. Caroline talked about how this initial prototyping phase has been formative for troubleshooting everything from the user-interface to the way that actual exchanges are facilitated through the network. When bartering skills and resources, it’s likely that at some point you’re going to actually have to meet somebody in real world. A Portrait Drawing class at Trade School. Rather then collect a pay check, or even offer their knowledge for free, teachers asked students for skills and resources in return for class time. Volunteer hours, fresh produce, vegetarian recipes, and personal stories on the class topic to share with the group were some of the things commonly exchanged. OurGoods itself is a collaboration. Caroline is working with Carl Tashian, a developer and engineer who was the senior site engineer at Zip Car; designers Louise Ma and Rich Watts to create the site’s user interface; and dancer/choreographer Jen Abrams is a long time member of WOW Cafe Theater (run by barter for nearly 3 decades) who is offering guidance and support. Both OurGoods and Trade School are creating functioning models of exchange in the cultural commons. What lessons can be learned from these projects as we embark on the creation of a commons in our own backyard? How will conflicts be handled in the Open Field? What kinds of networks will we create to accomplish our new projects there?